Interrupting your Valentines weekend and Family Day vacation in Canada with a brief update from Colombia. At La Golondrina channel sampling of active workings is now complete and samples are with the laboratory for analyses. Mapping reveals that the currently active workings represent three different levels spread over a vertical interval of approximately 20m. It appears as though these shallow-dipping levels are linked by steeper-dipping veins which miners follow upwards, as "ladder-like" guides to find new high-grade shallower-dipping vein structures. You will see from maps and cross sections on our web-site that current workings occur at the top of an approximately 450m vertical interval of about 20 known development levels. It is important to note that these old workings, most of which were developed during the 1930’s and are now collapsed, were developed by hand and that compressors and mechanized drilling have only been used in the area over the last 4 years. There has been no ventilation in any of the workings to date and so the lateral extent of underground development has been limited to less than 100m. We have been asked by some shareholders to illustrate the target concept at La Golondrina which we have done in the figure below. I need to amplify that this is not a resource estimate. It is simply a target concept using known vein workings and various assumptions as explained in the legend. It is important to note firstly that much of the license area is covered by soil and colluvium and secondly, that veins on steep parts of the hill have not been developed due to difficult access. Basically we do not know how many undiscovered veins there are at Golondrina yet and apart from having mapped three veins of mineable grade/widths over a 20m vertical interval at the top of the hill, we do not know what the stack frequency of quartz veining is. In any case, the illustration gives you some idea of our target concept and why we believe there is plus million ounce, high-grade gold potential at La Golondrina. You will have seen from our press release dated 28th January that Royal Road has executed a 3-month exclusivity agreement over the La Redencion gold mine which is located just some 450m to the north of the La Golondrina license boundary. 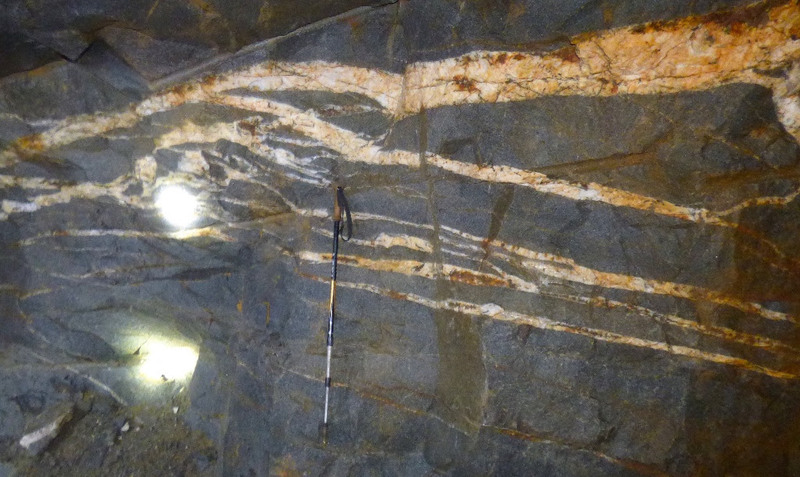 Mineralization at La Redencion is similar in style to La Golondrina and it may be argued that the two projects are part of the same overall gold mineralizing system. If that is the case, then the gold system has a vertical extent between both mine areas of about 700m, as La Redencion occurs some 250m below the lowest known vein occurrence at La Golondrina. Below are some photographs from underground at La Redencion. 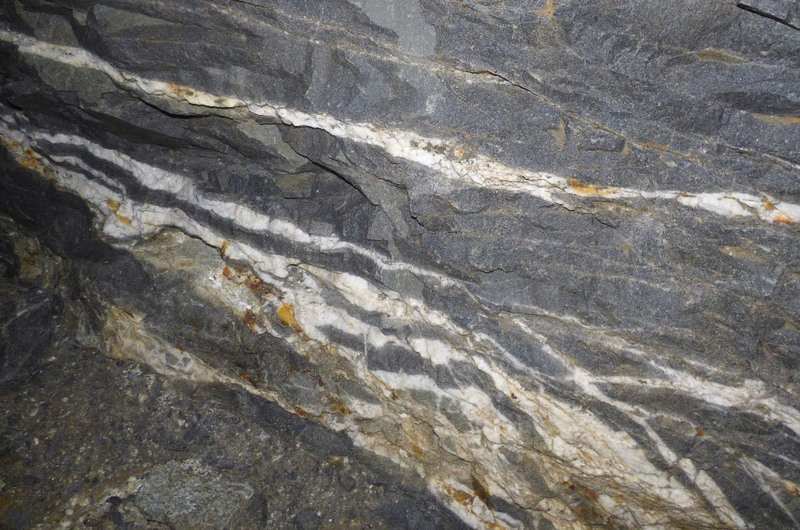 As you can see, the veins are more zonal similar to the “vein-zone” style of mineralization at La Golondrina. Currently we are post-processing and integrating 3D IP-geophysics and ground magnetics to define drill targets at La Golondrina. 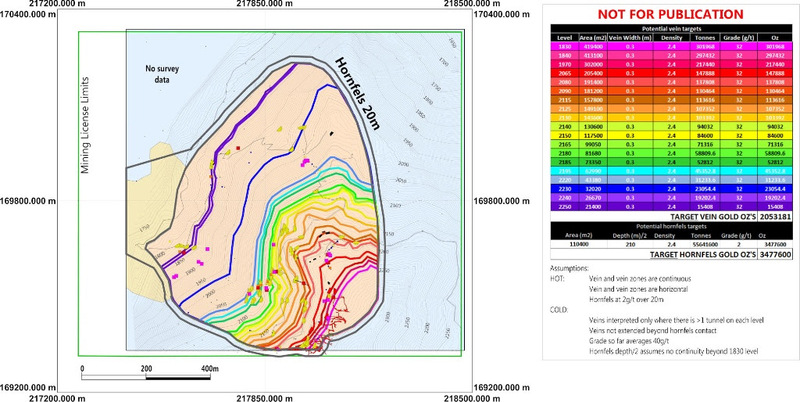 The IP data has identified a large chargeability anomaly at depth at La Golondrina and this anomaly appears to correspond with more sulphide-rich vein material which is exposed on surface and located vertically between the lowest vein at La Golondrina and the La Redencion mine. Channel sampling at La Redencion is about to commence and we are seeking independent contractors for environmental baseline work at the projects. Do not hesitate to contact me on tim.coughlin@royalroadminerals.com if you have any questions or comments and please come to see to us at booth 2342 at the PDAC from March 6th to 9th in Toronto. Redencion: Typical vein-zone with linking structures. We believe these linking structures are a scaled example of what happens in the district. Royal Road Minerals is a gold-focused exploration and development company. The Company's current area of interest is the highly prospective La Llanada gold district of southern Colombia. 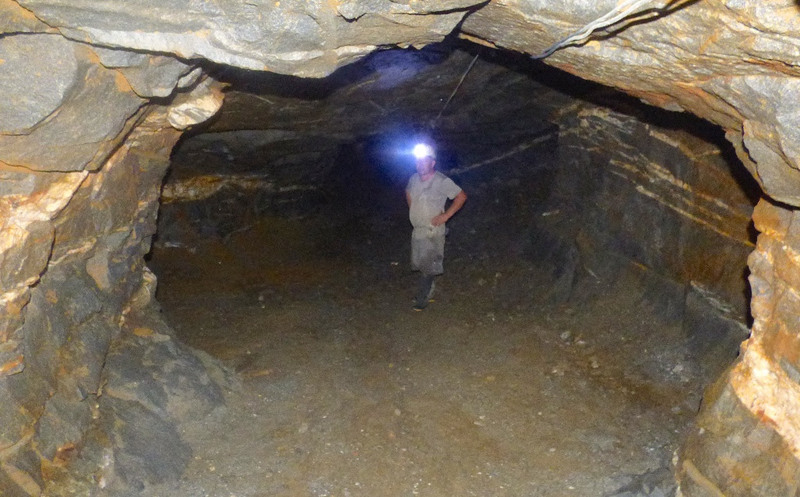 The Company has an option to earn 100% of the La Golondrina high-grade gold mine and has executed a 3-month exclusivity arrangement over the neighboring La Redencion gold mine.